Orcs are almost invariably born as twins. The bond between twins is integral and lifelong, with orcs living either together or as close neighbours even into adulthood. 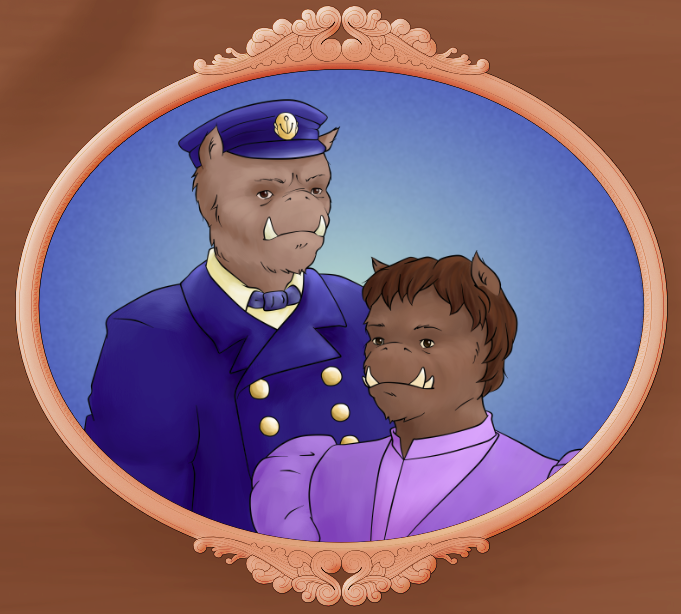 For an orc, aunts or uncles are as important as parents, cousins as close as siblings. For an orc to be born alone, then, is not only unusual but profoundly lonely. While loved by his family, Thuost always felt his difference keenly, and headed for a life at sea as soon as he was old enough to sign on to a ship. There, working alongside carefree elf men and homeless dwarves, he found a new family of his own, and soon grew successful enough to captain his own ship. Until one day, and much to his welcome surprise, his merchant trading partner Lilia proposed to him. Between Thuost’s ship, Lilia’s trade connections, and her sister Khadren’s cooking for the Bar None, the trio were doing quite well for themselves. The blockade changed everything. Echalian ships now block passage through the Orothan sea, preventing trade between Alsvoran merchant vessels and the Ichikan Isles, Alsvor’s primary provider of quartz. Desperate to find an alternate source for magical crystal storage, Thuost now sails increasingly dangerous and clandestine routes to try and meet demand. The only help from Alsvoran authorities has been to quarantine Thuost’s ship and crew – twice – allegedly to avoid the spread of foreign disease. Today Thuost’s ship arrived back in port, its legitimate cargo of Ralerin grain concealing a load of Echalian made mechanical prosthetics, the black market sale of which would finally get their family out of debt. Until Protectors stopped the ship in the harbour, claiming that they’d been sighted on the north side of the blockade. Echalia was known to be in the midst of a plague, they said. There could be no risk to Alsvor: the ship, and all its cargo, must be burned.